Wow! What a fun challenge on Splitcoast this week. This is the Side Spring Card and it really looks nice! I used the new Florida Beach & Waterscape Glitters from Sparkle N Sprinkle and they are totally awesome!!! 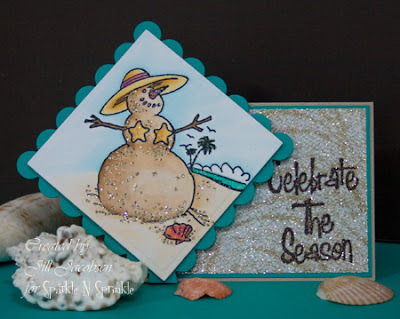 Florida Beach is so absolutely sparkly and with the glitter lace background the whole card just really sparkles! I also used it on the At the Beach snowman. The sentiment is actually embossed directly on the Glitter Lace background and picked up the glitter and looks great! For all the details on the products used on this card you can click here. Hope you have some fun with some challenges today!! I love, love, love this card! I would never have thought to use the lace with the beach scene - it's perfect together! This is awesome Jill - looking forward to the Flamingos tomorrow! Jill, this is one fabulously eye-catching card! Love all the colors - and the new glitters! Soooo pretty, carried thru on the lace technique, too! Thanks for inspirational ideas! This is so adorable! Love the glitter, can't wait til I get mine!